Anar Agakishiev is a talented makeup artist and hair stylist from Azerbaijan. He is a magician when it comes beauty transformations. Anar is known for his insane abilities to erase decades off his clients’ faces, banish wrinkles or cover the most noticeable scars and skin conditions with makeup. While most makeup artists prefer to feature ladies with model-worthy features, Anar Agakishiev is working mostly with mature clients (he even has clients over 80 years old) and women with serious skin conditions. Feast your eyes on his most amazing beauty transformations. 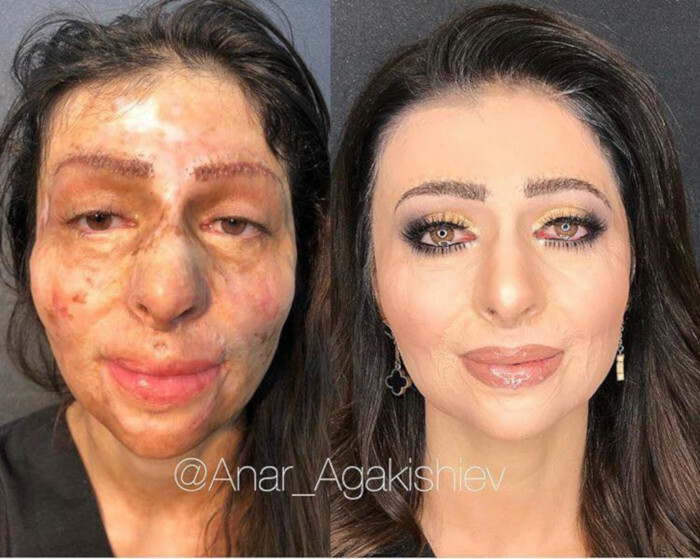 This is one of Anar Agakishiev’s beauty transformations that went viral. The makeup wizard helped a woman with severe burns on her face to cover her scars. The lady was so shocked by how different she looked that she got emotional. You can see the tears of joy in her eyes in this photo.